Before I begin on today's post, I'd like to apologize for my inactivity lately. I just haven't been inspired. Perhaps I've been too busy, running between my job as a caricaturist, my job as a character designer, my exercise classes, the KC pagan community and my own circle. Maybe I'm just took a short Witchy Words breather. Either way, I didn't want to force myself to write because I didn't want to produce something that wasn't up to Witchy Words standard. Even today's post isn't exactly what I had planned, but I thought you'd enjoy an update! If you've taken a look at my posts about my spiritual room, you'll notice the mirrored sliding doors in the southeast area. This leads to my spiritual storage closet which, to be honest, was an absolute wreck. 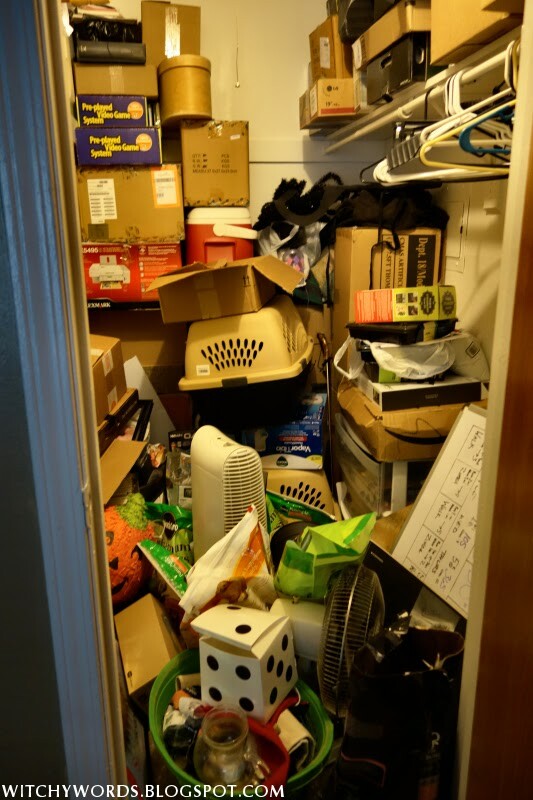 In fact, I don't think anyone aside from myself and my husband has seen inside that closet since we've moved. It's always in an uncomfortable state of "holy crap, things everywhere." And that's not the best energy for a spiritual area. Back in 2011, I thought it'd be a good idea to start accumulating large Tupperware boxes for spiritual storage. Better than cardboard, durable and it let me see what was in them. I got four boxes and would store two sabbats together, such as Beltane and Midsummer. And it worked! At least, it did for a while. But between leading Circles and becoming more involved in the community, I acquired more than the poor boxes could hold. Even when I added boxes, it didn't help because those same boxes made everything inaccessible when they were stacked on top of each other. 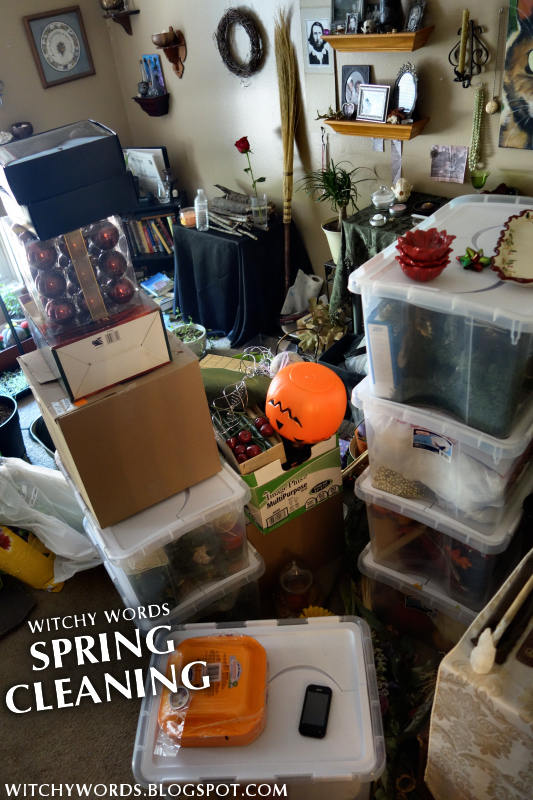 Once one sabbat was over, I'd have to cycle the boxes in the closet, which would involve pulling everything out and stacking back in. It was a huge waste of time and energy. And once I couldn't fit any more boxes in there, random items just started stacking on top of, in between and in front of the boxes. It was a total disaster. A week ago, I decided I'd had enough. It was time to start cleaning it out. This side was honestly the cleanest. I wish I'd taken a photo of the first side, which was stacked all the way to the shelf and beyond with boxes and things. By the time I remembered to grab my camera, I'd already pulled out the eastern side; my closet had spiritually vomited in the middle of my room. See, even Virgos can get messy! My first step in cleaning everything up was obviously dragging everything out. I also invested in a new set of storage items: shelves, sliding drawers and smaller boxes. Then came the fun part of actually sorting everything. Fellow CNF member and close friend Kolika came over to keep me company as I picked through each box meticulously. Eventually, I'd emptied most of the boxes out, stacking them in front of the doorway. If I hadn't used it in the past year, I gave it away, sold it, donated it or threw it away. There was no point in keeping anything that I didn't have a use for anymore. Even so, I found it difficult to sort everything on my shelves. They turned out way more cluttered than I'd originally envisioned. But, by the end of my sorting, everything was accessible and clean. 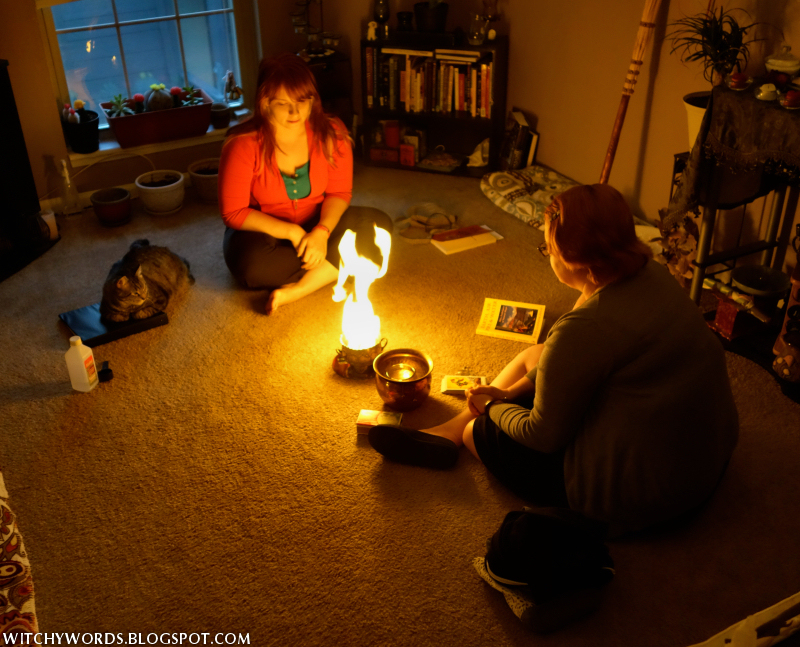 Not but a few days later, Jessica (also a CNF member and good friend of mine) and I put it to good use with a full moon ritual for the Flower Moon. Our ritual too involved a little spiritual spring cleaning, but it was amazing to have it in a room that was fully organized. Not at all! I'm a Virgo (a Virgo II, which is like the extreme form of Virgoism) and (jokingly) pretty OCD, but my closets still manage to get out of hand. Out of sight, out of mind, right? Even worse, organizing a closet can be a whole day or even week long project for me because it has to be perfect and spotless. But it's so rewarding in the end!